When we think fashion during wartime, it’s easy to conjure images of black and white, stern characters in the midst of a crumbling London in the Blitz. You’ll be surprised to find at the Imperial War Museum’s latest exhibition, Fashion on the Ration, a vibrant edge to the creative clothing in World War II. Curator, Laura Clouting explains, ’what is most surprising in terms of the womenswear is just how colourful it is…and the level of gritting your teeth’. So throw away ideas of dreary, dowdy greys and discover the new ways that men and women found to dress in a time of extreme adversity. With the 70th anniversary of the end of World War II and the countless tributes for the First World War Centenary last year, including the cascade of ceramic poppies at the Tower of London, Clouting explains that the IWM ‘wanted to mark that moment by looking back at the impact that the war had on people’s lives’. The Imperial War Museum archive of wartime clothing has been given a starring role in this London fashion exhibition: ‘it was a chance for us to showcase how clothing really tells us so much about life on the British home front’. Of course fashion rationing during WW2 brutally hindered wardrobe choices. ‘People had to put up with so many restrictions on their lives during the war. They had to endure so many austerities, so many instances of the government intervening in their lives’, explains Clouting. However the shortage of textiles and materials led to some spectacularly innovative experiments, including making earrings from spare aeroplane parts(! ), which have shaped the face of fashion today. An obvious example being that women started wearing trousers in World War II as a practical solution to life in the factories. One of the most famous pin-ups for factory safety was worker Ruby Loftus, who accessorised her utilitarian uniform with a colourful turban. With the blackouts during urban bombing, there was also a new fad for luminous brooches and buttons, and even leather handbags with gasmasks attached. Some women also used beetroot juice to stain their lips. And if you thought the onesie was just for Cara Delevigne, they were actually worn originally in air raid shelters! Clouting adds, ‘it was a bit of a double edged sword. The war was a very difficult and tiring thing to live under, but in turn, it inspired a creativity and desire to make the most of the limited resources to hand’. Encouraged by the government's scheme 'Make do And Mend', women adapted clothes from what was available, like their husband's suits and even old blankets. Fashion magazines like Vogue helped to propel the government's mantra of factory safety and encouraged women to cut their hair short with glamorous cover models. 1940s street style was robust and designed to stand the test of time. The Fashion on the Ration exhibition also places fashion in the wider context of our cultural history. We are particularly fascinated by the use of clothes to reflect the impact of war and the personal struggles to express identity without the freedom of colourful fabrics and quirky styling. In an age when making your own clothes couldn’t be more alien, this fashion exhibition sparks the imagination and reveals the determination of enduring fashion, uniforms and textiles in wartime Britain. 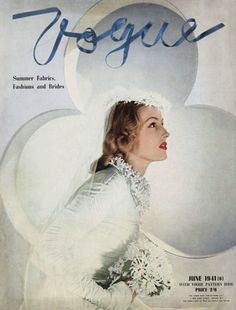 Culture Whisper loves British Vogue covers during World War, here is a selection of our favourites!